Here's the traditional year-end review that many blogs do. I reviewed all 323 blog entries from 2011, looking for my favourite entries and photos. This has to be a tie between the Coors Light train and my visit to VIA Rail's Winnipeg Maintenance Centre. Both were very fun to do and write about, and both had good response from you, Dear Reader. For Coors Light, there was my post on the actual sighting, as well as the design of the wraps and sightings by other people (and more). I'm honestly surprised that both VIA 6408 and VIA 6445 still have the Coors Light decals on. I guess they will be refurbished last! The post about the Coors Light train itself (Number 1 With A Bullet) was my most read post ever. I did a six-part series on the Winnipeg Maintenance Centre (1, 2, 3, 4, 5, 6), including a tour of the F40PH-2, as well as a glimpse of the Northern Spirit cars stored outside. That was so much fun to write! Runners-up include my two-parter on the Prairie Dog Central steam engine (1, 2), the St. Stephen railway station, Evraz in Regina, a CN 111-CN 304 meet, and of course the CPR Holiday Train. These are my favourites from 2011, in no particular order. Some many not be my technical best but I like them for sentimental reasons. It's been a great year for blogging... my fifth full calendar year of blogging. See you in 2012! Ed Weisensel reported that SFEX 4204 was spotted on Norfolk Southern's train M4NB22 in Ohio. He confirms it is heading to the Morristown and Erie Railway in New Jersey. You may remember that SFEX 4204 worked on the New Brunswick East Coast Railway for a time before its retirement. When CN purchased the NBEC it became CN property and made its way to the boneyard in CN's Woodcrest facility in Illinois. At that time I figured it was destined for the scrapper. Apparently 4204 left CN's Woodcrest shops over 4 months ago and has been rattling around the system in Minnesota, Wisconsin, and so forth before returning to Woodcrest before heading to its "final" destination. The Morristown and Erie Railway is a short line railway in New Jersey and Maine. They also operate the Maine Eastern railway. They operate a number of Alco units including other C-424 engines. See their all-time roster. It's nice to see the old lady is still around! By the way, check out Ed's photos on Flickr. He has quite a few nice Canadian Pacific shots. It's almost the end of 2011... almost time to switch to a new calendar! Here are a few trains I saw in late December. I made a point of seeing Tuesday's VIA 693 (Hudson Bay) because I thought the blue-and-yellow VIA 5649 might be on the end. It wasn't, but it was a good first test of my new lens. To be honest, it was a grab shot as I wasn't expecting to see it. I was fortunate that it was about half an hour late leaving Winnipeg. This morning, December 30, I went prowling around CN territory to see what was going on. There were a couple of humpyard sets of GP38s and slugs working, but no trains in evidence. Up at Transcona, CN 106 was in the yard and about to get refueled. CN 2693 and CN 5702 were on the head end, and there was an SD70M-2 part way through the train as a DPU engine but I didn't catch the number. Back in Symington, a four-unit set was running light through the yard: CN 8960, CN 2416, IC 2716, and CN 2295. I took photos but they were quite backlit. I saw another two unit set with a black IC engine but I wasn't able to get a shot before they zoomed out of sight. I hope to post once more for tomorrow before wrapping up 2011. Rapido Trains will be producing a model of the uniquely Canadian GMD-1. They produced a very entertaining video about it. Normally I would put that on my model train blog but I mention it here for a couple of reasons. One, I've always loved the GMD-1. As an East Coast guy the GMD-1 was foreign to me and I was fascinated by my occasional glimpses of the ugly duckling when I visited the West, or the one time I saw one in Saint John. Two, Jason Shron used my footage of the Canadian he was riding on in his video. The first usage was from 00:40 to 01:34, featuring my pacing video of the train. The second was from 06:07 to 06:42 with a straight runby. I took that back in October when Jason put out the call for video. Jason was kind enough to send me a VIA-CN passenger car as thanks for the video and credited me very nicely in the above video. I encourage you to watch it. It is quite entertaining. I will be waiting for the GMD-1 to come out! In the meantime, here's CN 1412 working a pipe train in Regina, Saskatchewan back in June 2009. Here's a nice slide of CN 1757 in Halifax, NS by Glenn Courtney. This was shot on December 27, 1988, 23 years ago. It looks like it is in the Rockingham yard. Notice the Newfoundland container visible on the left side of the slide, which is interesting since the railway was officially shut down in Newfoundland on September 1, 1988. CN 1757 was originally built as RS-18 CN 3852 in 1960. It was rebuilt in 1975 as part of the RSC-14 conversion project by replacing the 4-wheel trucks with 6-wheel trucks (center truck unpowered) and reducing the horsepower from 1800 to 1400 HP. She was retired a few years after this slide, on September 30, 1993. It was converted back to an RS-18 using the trucks from CN 3615 and renumbered back to 3852. It was first leased, then sold, to the Cape Breton and Central Nova Scotia Railway in 1994. It was named Sir J.S.D. Thompson while on the CBCNS. She was scrapped in March 1998. More details have emerged on the "new" locomotives being leased by the New Brunswick Southern Railway. 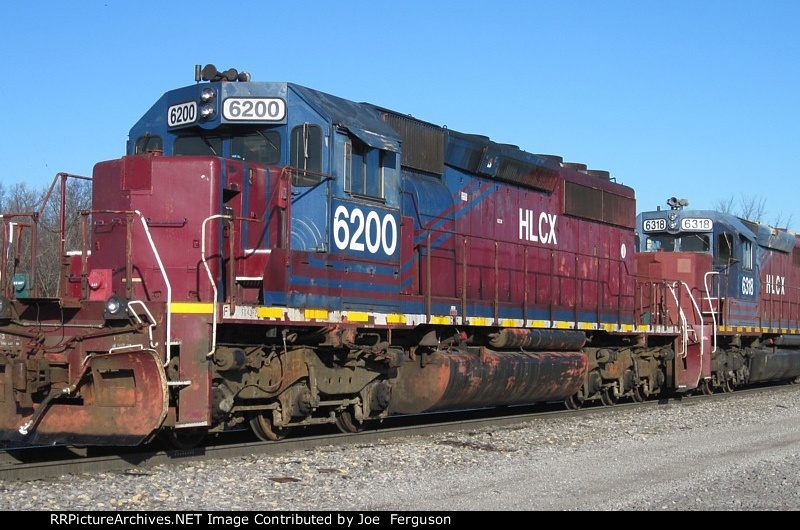 The two engines are HLCX 6200 and 6318, both SD40-2 engines being leased from Helm Financial Services. The engines were delivered by the Alton and Southern Railroad to CSX in St. Louis. A CSX trace shows them in Duquoin Illinois at 07:50 on December 24, waybilled for Saint John, NB. Joe Ferguson shot them in Duqoin on December 24. I encourage you to click on the link to the left or on the photo below to see the full image that Joe Ferguson took. HLCX 6200 is ex Chicago and Northwestern 6822. At one time it had the CNW yellow and black livery before being painted into the hideous purple and blue HLCX livery. There are plenty of photos of HLCX 6200 online. HLCX 6318 also has many photos online. I hope they are repainted when they arrive in the Maritimes, but given that the other Helm leasers are still wearing the ex-Union Pacific colours, I'm not holding my breath. What do you think of the Helm colours? Thanks to Jeremy and Dave Dineen, Jeremy and John J. for the news. However you celebrate it, may you have the best of the season! Long-time Winnipeg resident BNSF 2756 headed south to the USA for its yearly maintenance and checkup on Wednesday. Green and white GP39V BNSF 2968 has replaced it. I have yet to see BNSF 2968 but I did catch BNSF 2756 on its way out, quite by accident. I had stopped by Portage Junction Wednesday afternoon with the hope of seeing some action. I saw CN 5726 was in the Fort Rouge yard with another engine behind it, but I couldn't see the engine coupled onto 5726. The roofline looked a bit odd. Soon after I arrived, CN 2450 led a westbound freight train through Portage Junction. I took a few shots of CN 2450, the sole power on the grain train. I don't know what happened to this side of the engine but it definitely stands out. I shot CN 2450 one other time, November 20, 2010, and it had the same "mark" then, so it is not new. As CN 2450's train rolled on past on the south track, an eastbound CN intermodal came up on the north track. I didn't catch the engine numbers but it was quite a long train. Once the last grain car went through the Junction, CN 5726 pulled out and began shunting. Much to my surprise, BNSF 2756 was the second unit! These two were the power for train CN 532 to Emerson. BNSF 2756 was online and rumbling away as they put their train together. I couldn't stay to watch CN 532 leave, but I was glad to get a few parting shots of 2756. Later, I caught CP 1532 and CP 8205 working the Fort Whyte area with some covered gondolas. Finally, I saw CN 8898 leading CN 2440 and an eastbound train near mile 10 of the CN Rivers subdivision. BNSF 2756 has been the Winnipeg engine for almost a full year. It came in mid-January 2011. The Northern Spirit cars that have been stored at the Winnipeg Maintenance Centre have been sold "to Mexico" and are being prepared for movement. They are up beside the WMC all coupled together. I'm told they are going by CN but I do not know when. Also, baggage-coach car VIA 5649 was at the WMC on Wednesday. VIA 5649 is an old ex-CN car that is still painted in blue and yellow. It and two other blue and yellow cars are used on VIA trains 290/291 between The Pas, MB and Pukatawagan, MB on the Keewatin Railway. I assume it was brought to Winnipeg for servicing by VIA 692 and will return soon on VIA 693. VIA 290/291 are odd ducks. They are listed on VIA's site but you can't book them there. You have to contact the Keewatin Railway Company by phone. VIA 5648 and 5649 are listed on VIA's site. They were built in 1954 by the Canadian Car and Foundry company. The third car used on the The Pas-Pukatawagan line is VIA 3248, a cafe-coach car also built in 1954. Clayton Chaloner has a nice photo of VIA 3248 on the tail end of VIA 692. I'm late posting about this, but better late than never, right? Am I right? I did a bit of Christmas shopping on December 7 and I ended up downtown at the Forks in Winnipeg. I took a few photos for my Google+ account, and while I was doing that, I heard the rumble of a freight train. CN 2583 led an eastbound freight over the Red River and I shot it against the sun. Not my best work! The light was very challenging, to say the least. CN 8800 was the trailing unit. After that, I headed toward Symington Yard. I had heard that a Hudson Bay Railway engine was parked by the shops, and I did see it on the night of the CP Holiday Train. I took a few photos then but they were not good. This time, the light was much better and I captured the engines from the side of Lagimodiere Boulevard with my 75-300mm lens. The three are HBRY 2506, HLCX 3815 and HLCX 3841. The last two are from Helm Financial and are clearly of Southern Pacific lineage, by the colour scheme. Here's a closeup of HBRY 2506, lettered for the Central Kansas Railway. It's a GP20. I don't get the logic of showing "HBR" and "Central Kansas Railway" together... maybe Omnitrax knows the reason why. The Central Kansas Railway is defunct and the line was purchased by Watco. While I was shooting those, who should show up but CN 2583 again, running around Symington Yard on the loop track with CN 8800. The Hudson Bay units are gone now, so I was glad to capture them when I could. I was all set to write a blog post about the Assiniboine Valley Railway last night, but I noticed that John Longhurst wrote a blog post about it the very same day! So... read his post and enjoy! The reason I was going to write about it is because my son and I took a ride on the AVR last night. Here's the video I took of the ride. We were with a group, so I didn't take any photos there. I believe we were riding behind the maroon "CP" engine. They have quite an operation! When I was in Tennessee earlier this week, I had a chance to step into Kentucky on Sunday evening. Since I was in Clarksville, it was a mere 5 or 6 miles of driving to cross the border into Kentucky. I chose Guthrie because it was close and it had a few rail lines showing on the map, including an interchange. One of them was clearly the R.J. Corman Memphis Branch that goes through Clarksville, but I was not sure what the other line was that they interchanged with. I thought it might be another R.J. Corman line. It was after dark when I left Tennessee and stumbled into Kentucky, but that's OK. I drove down into the town of Guthrie and headed for the first rail line I saw. I noticed that the line was signaled and that there was a green light facing west. I looked at the crossing and I saw a CSX sign there. "CSX Transportation. To report stalled vehicle blocking crossing or other emergency CALL 1-800-232-0144. Refer to crossing 345 229 L located at 00H 215.95 milepost." Ah, CSX! That explained the signals. I would not have expected a short line to have signals on their line. This was a good sign. I hadn't seen any CSX action since May 2007 when I was in Chicago. After that roared by, I went prowling around the town. R.J. Corman has a four-door engine house in the wye. I tried to take pictures but they didn't turn out very well. I expect there were engines inside but there were none outside... except for CSX 2630 (a GP38-2) idling in the CSX yard. I was mindful of the NO TRESPASSING signs and it was not in a photogenic location. I drove a bit east of Guthrie and stumbled back into Tennessee. Guthrie is really close to the border! While shooting photos of the moon, I heard horns blowing so I waited for the next CSX train. It was not a long wait. This coal train had three engines: CSX 306 (AC4400CW), CSX 5457 (ES44DC) and CSX 20 (AC4400CW). I went back into the town and poked around a bit more. I saw a green light facing east so I parked at the east end of the CSX yard, hoping the yard lights and my car's headlights would provide better illumination. While I was waiting, a fellow stopped and asked if my car had broken down. "Nope, just waiting for a train, thanks!" It turned out to be another coal train. The two engines, CSX 778 and CSX 783, are both ES44ACs. I found a Louisville and Nashville caboose on display, and I was just about to take its picture when I heard the distant sound of horns again. Back to the crossing to shoot... another coal train. This one had CSX 537 (AC4400CW) and CSX 4500 (SD70MAC). The train slowed down and eventually stopped, for a meet. I was stupid and didn't get in the right position to catch the other train of the meet, although I did see it roar by. I went back to grab a shot of the L and N caboose and then headed back to Tennessee. Not bad for two hours in Kentucky. A portion of the Gaspé line between Chandler and Gaspé has been closed for bridge work. The Grand River-Pabos bridge needs about $650,000 of work done. It is estimated that it may take up to six weeks to complete the work. During this time, the VIA Rail train will turn at New Carlisle and passengers will be bused the remainder of the distance. Let's hope the work is done quickly so the Chaleur can get back to its full route. PS - sorry for the gap in posting. I was in Tennessee again and did not have any spare time for the blog. I'm back now. On Saturday, December 3, I was driving around Winnipeg just after noon, looking for trains. I first drove around CP's yard downtown, finding a few engines here and there but nothing too interesting. The most interesting unit was CP 5911, an SD40-2 bearing a full height multimark. Stifling a yawn, I drove down to Main Street... and spied a Park car sticking out of the VIA Rail station. This surprised me, because it was 12:40 and the Canadian should have left at noon. I decided to head over to CN Subway quickly to catch the Canadian. Subway is at the north end of the CN Fort Rouge yard, and is accessible to railfans from the Co-Op gas station parking lot on Osborne Street just south of the CN overpass over Osborne. I waited for the Canadian, but the first piece of "bread" in this Subway "sandwich" was CN 190, with Dash-9 engines CN 2638 and IC 2713. They rolled by at 12:55. I waited... and waited... and finally the "meat" of the sandwich was delivered. VIA 6417 and VIA 6432 lead the Canadian past the under-construction BRT station over Osborne at 13:15, on the north track. I shot the Canadian, and as I was getting into my car to leave, I heard the hum of approaching engines. The other piece of "bread" was CN 199, pursuing the Canadian but on the south track. Dash-9s IC 2719 and CN 2680 were the engines on the head end at 13:19. By that time I had my "fill" of trains, so I headed out... until the evening's CP Holiday Train at least! PS - I suppose I could have titled this post YAD9 for "Yet Another Dash 9" but it wasn't very clever. I just discovered a former R.J. Corman locomotive, RJCR 3501, stuffed and mounted in Clarksville, Tennessee. The engine, and accompanying caboose, are parked beside the former Louisville and Nashville station. The station itself is privately owned by the Montgomery County Historical Society. Just to the right of the engine is the operating Memphis branch owned and operated by R.J. Corman. The history of this engine is confusing to me. If you believe this site, 3501 was built as Southern (SOU) 2641, a GP30, in October 1963. However, if you believe this other site, 3501 was built as SP 7472 in June 1964! This site agrees with the first one, that it was a Southern engine. It goes on to say that SOU 2641 was wrecked in 1965 and given a GP35 carbody. That site says it was retired from Norfolk Southern in 1991 and sold to R.J. Corman in 1992. Everyone seems to agree that it is now a GP35m and it has been retired and donated to the city of Clarksville. I'm glad they can agree on something! There's some information on the station here. A new art exhibit celebrating New Brunswick's railway heritage is having its opening reception on Thursday, December 15 from 7-9 PM. Art on the Rails features paintings, model trains and train memorabilia on loan from various sources. The exhibit will be at the Andrew and Laura McCain Art Gallery (ALMAG) in Florenceville, New Brunswick. 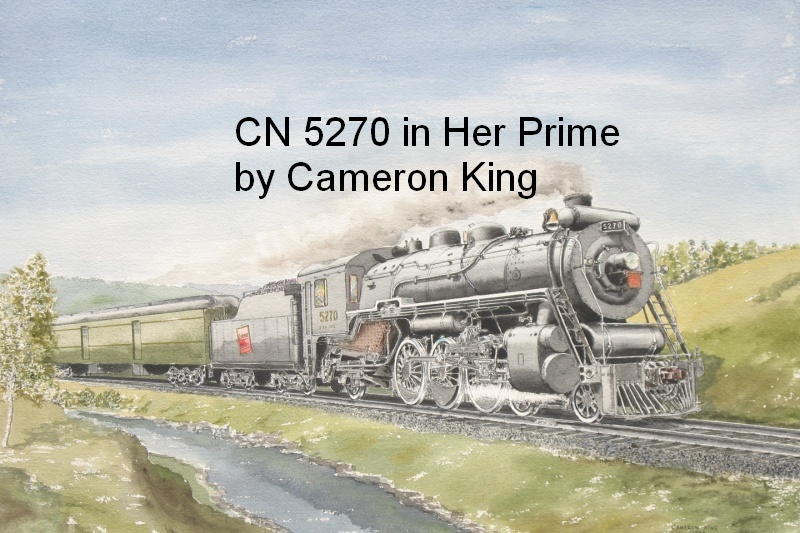 The exhibit will feature paintings by New Brunswick artists Cameron King, Delores Bohan, Jean Haywood, Roy Tibbits, Wentworth Folkins, and a model train from the collection of Norman Boomer. The exhibit will remain in place until January 19, 2012. Admission is free. The ALMAG is at 8 McCain Street in Florenceville (here). PS - I wrestled a bit about posting the image of Cameron King's beautiful painting. On the one hand, I want to show his beautiful work, but on the other hand I don't want to violate copyright. I decided to write on it so you can see his work but make the image fairly useless to copy. I don't know if it was the "right" decision or not. David Othen has two new videos for sale... "CB&CNS on Mainland Nova Scotia" and "Urban Rail in Chicago & Seattle September 2011". Here's a clip from the CB&CNS video. I regret that I never railfanned the CB&CNS, not even once. I suppose there is still time but it is hard when you're a few thousand kilometres away! Here's a clip from the Chicago and Seattle video. Now, Metra... that I did railfan, once. This is one of my videos. Please go to David's video page to order either of the videos, or any of the others that he has for sale. CanadaEast is reporting that the Port of Dalhousie and CN have come to an agreement to retain the Dalhousie railway subdivision. You may remember that the last Dalhousie local ran in the summer of 2008, shortly after the last customer closed. The line was offered for sale in June 2009. The agreement between the Port and CN is confidential but Port manager Brian Hyslop said "if we exercise the options in there, we have rail service for the next 21 years." The Port has leased the line, but CN will operate and maintain it. Good news. The next task is for the Port to get some traffic onto the line to justify their investment. On Saturday November 26 I did my usual survey of the CP yard in downtown Winnipeg, Manitoba. There were a collection of the "usual suspects" (GP38s, AC4400s, SD90s) with a few more interesting units. The first was CP 8957, another one of the shiny new ES44AC engines that Canadian Pacific Railway has purchased. Canadian Railway Observation's December issue has a better photo of 8957 by Ken McCutcheon in Assiniboia, Saskatchewan. For me the most interesting unit in the yard was CP 9015, a "red barn" SD40-2F. Blog readers know I like the red barns, but this one is special because it has a rebuilt nose. CP 9015 was involved in a grade crossing accident with an oil truck earlier this year (I believe) and the Weston shops here in Winnipeg rebuilt the nose end. Compare it to CP 9017... shot here in Winnipeg on October 25, 2009. The candy stripes are gone, the bell is painted, and most importantly, the shop didn't bother repainting the whole locomotive! Given the age of the red barns, it doesn't make sense for CP to spend a lot of time and money doing cosmetic work to them. Here's a photo of CP 9015 from Flickr. Complete list of units seen. The trailer for "De-Railed: The National Dream" is up. This is a documentary on Canada's short-line passenger railway systems. There's a blurb about it here. The film-maker, Dan Nystedt, interviewed me for this back in early 2010. I don't know if any of that footage will make it into the film, and if it doesn't, that's totally OK. :) Have a look at the trailer. I am looking forward to the film when it comes out early next year! Finally I was able to see a Holiday Train! Canadian Pacific Railway is again running a Holiday Train across Canada (and another across the USA) to raise funds and food for local food banks. I have been away for work the past two years and did not see it pass through Winnipeg. Fortunately this year I was home and could get out to see it. The train was scheduled to arrive at Molson Street a little east of the CP yard at 9 PM. I drove up there and saw that the train was waiting a bit east of that at 8:45. I took a few photos and then struggled in vain to find a parking spot. It was crowded! I ended up parking a few streets away and hoofing it with my camera bag and tripod. The train has some performers on board who do a little show at each stop. I was on the other side of the train, taking photos of each car, so I didn't actually see the performance... but they sounded good! The CPR Police were out in full force and the Winnipeg Railway Museum had volunteers on hand to help with crowd control. Everyone seemed to be having a good time and nobody was doing anything stupid like climbing on the train or crossing between cars. I took some photos of CP 9815 on the head end before proceeding down the train. For most of my shots I used a 10 second exposure to bring out as much light as I could. I set a 2 second self-timer so I could press the shutter release and then let the camera settle before taking the shot. It seemed to work well. The weather cooperated... no snow and not too cold. I was all bundled up and nothing but my finger tips was cold. Did you know they have a stage on CP 42901 that folds up and down? Sorry for the grainy photo - this one was hand-held. They started loading the performers and stage back up around 9:40 PM and were on their way before 10 PM. I believe they laid over in Winnipeg over night and headed out in the early afternoon for a mid afternoon stop in Portage la Prairie. It was snowing so I decided not to chase them out there. If you get a chance to see the train, do so! It's very impressive. Here's the Canadian schedule and the American schedule. Please consider donating food, money or time at your local food bank. Here's a list of Canadian food banks. In Winnipeg you can donate to Winnipeg Harvest. I'll leave you with the VAN HORNE and the tail end of the Holiday Train. Highball! Lots of RDC news these days. For example, VIA Rail posted a short article about their refurbished RDC going for a test drive. This RDC is a baggage car, VIA 6251. It has a new, lower-emissions engine as well as numerous other improvements. It has been refurbished at Moncton's Industrial Rail (IRSI) facility. An RDC was spotted on the tail end of VIA 2, the eastbound Canadian. This was IRSI's 6202, loaned to VIA to work on the Sudbury-White River run. I'm guessing it was tacked on to the end of the Canadian because there were already two Rocky Mountaineer cars on the head end between the engines. Of course, I already mentioned the RDCs that passed through Winnipeg on their way east. There are rumours that one of them is stopping at Sudbury to work the run to White River. This past Thursday, December 1, I went out to shoot the Canadian as I often do. I stopped just west of Carman Junction on the CN main line. Very soon CN 101 showed up, racing ahead of the Canadian. Often if I have time, I fire off a test shot to check the exposure before actually shooting the train. I tried to do that with 101 but the camera didn't work. I looked at it and the door to the SD card slot was open... and there was no card! I knew right away that I had left it in my computer at home. It's not like this was the first time this has happened. Fortunately I was about 10 steps from my car, so I sprinted over and pulled one of my spare cards out of my camera bag and jammed it in the camera. I raced back and had just enough time to shoot 101. Whew. CN 101 had CN 8902 on the head end. CN 8890 was a DPU engine about 1/3 of the train back, and CN 8840 was pushing hard on the end. Three SD70M-2 engines on one train! The Canadian came along shortly after that. It had 3 engines instead of the usual 2... 6456, 6442 and 6405, all rebuilds. It is getting rare to see an unrebuilt engine on the Canadian now. I heard them say they had an "advance Clear to Stop" for Diamond. That meant they were probably going to meet a train at Diamond, so I gave chase. The road was a little slippery so I was driving well below the limit. I heard someone tell VIA that they were "good on the north" so that told me they had already met someone. Sure enough, there was a CN train heading east on the north track. A quick, safe U-turn later and I was chasing CN 5730 East. I got ahead of them twice, once at Charleswood Road to get the still below and then again to get the video below. You can see it was kind of a gray day. The sun was teasing me when VIA was imminent, but by the time CN 5730 came by it was hiding again. Later, I was heading home when I heard that CN 532 was leaving Winnipeg for its daily trip to Emerson. I saw it from the south Perimeter Highway, so I drove through St. Norbert to shoot it. I waited just south of St. Norbert... and waited... after a while I saw movement on the track, and it turned out to be two deer! This was the best of the photos I took. The telephoto lens does exaggerate bumps in the track but there is quite a dip in the tracks here. CN 532 came rumbling along and scared the deer away. I only took a few shots in the falling dark and this is my favourite. Mmmm, lens flare.